The Lift-Slab House by Kenneth H. Gardner, 1960. Canadians can rightfully be proud of this mid century modern gem. Amazing mid century modern architecture by the super talented Canadian modernist architect Kenneth H. Gardner. 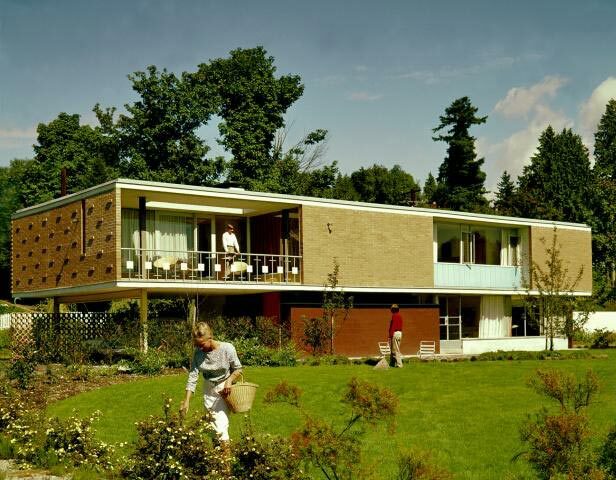 Kenneth H. Gardner designed this house for his own family in 1960. This modernist gem is located in Vancouver Canada. Very minimal modern. Beautiful! Photographed by Canadian photographer Selwyn Pullan. Located in the semi-agricultural Southlands area of Vancouver (at least it use to be in 1960), the home of architect Kenneth Gardner rises above its flat site as a graceful geometric form which appears to float suspended in space. Structurally the house is entirely concrete, masonry and steel. Its 2000 square foot floor and roof slabs supported on eight steel columns. Its crisp lines and graceful proportions offer a refreshing new influence to the residential scene. Its design reflects the contemporary interest in formality and dignity; its materials indicate a new respect for solidity and strength; and its construction shows a desire to explore promising new building techniques. As an outstanding example of West Coast residential architecture, the Kenneth Gardner home received an Honor Award in the 1960 AIBC-WH&L Western Home Award Program. The house asserts its independence of the alluvial flatlands on which it is built. "A geometric object in an amorphous environment," architect Kenneth Gardner has called it. The 2.5 acre site in the Southlands district below SE Marine Drive in Vancouver is semi-rural in character, an area where riding, golfing and light farming seem logical pursuits. The site itself helped to determine the nature of the house. A basement is not practical in this low-lying land, and ground level living is not desirable. Low maintenance was an important requirement the Gardners felt, and a fire-proof structure was also desired. The solution was to locate all living and sleeping activities on one level, and to literally lift the concrete roof and floor slabs up.